Every startup, even those with the most passionate users, will hit a word-of-mouth ceiling. Eventually, they’ll have to start being deliberate about growth to make sure new signups actually stick around – and that requires having data to show what users are doing inside your product and a team that can capitalize on those insights. This is what Siqi Chen was tasked with as the VP of Growth at Postmates, where he started and built the growth team from scratch. That team would expand to include growth engineering, user acquisition and growth marketing. Siqi took a new role the end of 2017 as CPO at GloStation, an Alibaba backed VR escape room experience, but joined me on our podcast to walk back his Postmates lessons while they’re still fresh. We chat about where his team found the low-hanging fruit in its earliest days, when being data-driven goes too far, the values that guided his growth team and much more. Below is a lightly edited transcript of our interview. This is the first in a series of interviews over the next couple months about unlocking the potential of growth. If you enjoy the conversation and don’t want to miss the rest of the series, check out more episodes of our podcast. You can subscribe to it on iTunes or grab the RSS feed in your player of choice. Adam Risman: Siqi, welcome to Inside Intercom. You’ve been at small startups, name-brand tech companies and everything in between. Quickly walk us through how you got to where you are today. Siqi Chen: I started as an engineer at NASA when I was working throughout college. I worked at Jet Propulsion Laboratory in machine visions, so automatic camera calibration for the Mars Curiosity and Science MSL rovers. From there the Web 2.0 bug hit me. I worked at pretty much the only startup in San Diego at the time, Veoh, which was a YouTube competitor. In 2007, Facebook came out with platform and I developed a game called Mafia that quickly made $3,000 in ad revenue. Then I built another game called Friends for Sale, which became the second largest app on the platform with a couple million daily active users. That led to VC’s calling, and I always wanted to be a founder, so we ran that company about two years. It grew to be about forty people and was profitable, but nowhere near as big as Zynga (who acquired us). In 2010, I joined Zynga, first as Director of Product for studios, and then ran Product Management for the company as a whole. Two years later I left to start a company called Hey, which was a heck of a roller coaster ride. We built a journal app called Heyday that won editor’s choice at Apple. Then that wasn’t growing, so we pivoted ultimately to an infamous app called Stolen, which turned your Twitter graph into a market economy. That got shut down by an act of Congress, and then in mid-2016 we were acquired by Postmates, where I started the growth team. I was there until last November, when I moved to Hong Kong to do VR. Adam: How did you define the growth org at Postmates? For instance, was growth marketing part of that umbrella? Where were the boundaries drawn, if there were any? Siqi: It changed dramatically for the entire time I was there. When I started there was just a consumer product team, and there was a growth marketing team that was mostly marketing. What I quickly realized as I was running the consumer product team was that we didn’t have very good visibility into user behavior. The amount and quality of instrumentation weren’t quite there, so the growth team really started as the growth engineering team. It was myself, a PM, an analyst and one engineer for the first three months, and we had to lobby pretty hard to start the team. We just tried to fix data, so we put together a growth marketing stack and an analytics stack. We tried to validate every single event that a user could possibly do. For a few months it was a struggle, because we had a team called growth, and we weren’t growing anything, which you can imagine is not the best place to be when you just joined a company. We tried to validate every single event that a user could possibly do. We started chopping that low-hanging fruit down on the sharing side and on the onboarding side and it was very significant. Through that you get a little bit more credibility and trust with executives. That’s how growth marketing was folded under growth. Then performance acquisition was folded under growth and we became a proper growth team as opposed to just a growth engineering team. By the end of my career there, we also had all of the local GMs and CE managers also reporting to growth. Adam: You mentioned how hard you had to lobby to get the team started. What were you struggling to convey to leadership? Prioritizing is the most important thing you can do well with product management, because no one has enough resources. You always have a finite amount of things you can do in a finite amount of time. So your output is almost always defined by how effective you are at doing the right things. The only way you know what the right things are is to know what is happening, and that was the argument I had to make. Adam: How did you approach prioritization once the team got started? When there’s so much low-hanging fruit to pick from, how do you decide what to pick first? Siqi: When there’s low-hanging fruit, a growth model should provide you that answer. Say you have one particular feature that could increase user numbers by ten percent and another one that can increase morale by ten percent. You could throw that into your growth model, and if it’s a proper growth model you can define how much impact you want to see by when. In our case we wanted to see impact in a very short amount of time, within two weeks. Depending on what the model outputs, you can decide on whether onboarding or virality make more sense. In our case we did onboarding first. To be able to say, hey for all customers coming in who install, ten percent more ordered. That means over the long run, no matter how big we are, no matter what happens, our business has been made ten percent larger. That was a powerful thing. Adam: That makes total sense, because with a product like Postmates the user’s expecting to see that value almost right away. They’re logging in and getting set up because they’re hungry or need something delivered to them in that moment. Siqi: Exactly. The other challenge with Postmates is differentiation, because people outside of Postmates see it as a very generic product. You have DoorDash and Uber Eats, but Postmates actually does something that none of these other competitors do, which allows you to get anything from anywhere. A vendor doesn’t have to be a partner with us; we will send a Postmate to pick anything up. You can go get a Nintendo Switch from Target if you so choose. 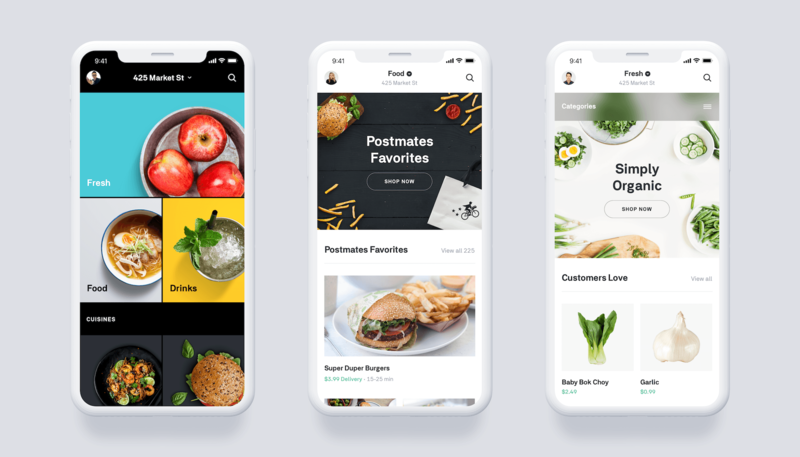 Showing new users that items like alcohol and groceries could be delivered with Postmates helped illustrate how to unlock the most value from the product. When I first joined we did some user testing around that exact user proposition, and that was always a magic moment. People were saying, “You can do more than food with Postmates.” A lot of our testing was around how to expose that value early. Adam: How did you bring that forward as far as getting users educated on what the product can do once they sign up? Siqi: Aside from just the blocking and tackling, and making sure the onboarding sign up flow is good, showing you the right merchants that you actually like had a dramatic impact on our ability to convert a new customer. Particularly when we show you a few tiles of restaurants, and then we show you the Postmates general store, which lets you get toiletries, razors, shampoo and that kind of thing. That’s when people realize this is a lot more than food, and they become a lot more excited about it. That moved numbers quite a bit. Adam: Speaking on where to get started with growth challenges, you’ve said that early stage companies often confuse growth problems with product/market fit problems. How do you personally distinguish between the two? Siqi: I’ve had a hard time doing that. At my last company, Hey, Inc., that’s probably why we spent two and a half years continuing to work on a product that didn’t really have product/market fit. I thought if we just kept on iterating on it and making it better, and making the growth better it was going to work, but it never did. Objectively, it’s so much easier to give advice when you’re not in thick of it and you’re not working on your own product. You can look at product/market fit qualitatively and quantitatively. Qualitatively, is there excitement and love from your customers? Can they not live without it? If they’re all absolutely raving about it, then it’s not just the first time, right? It’s easy to get excited the first time, but a month or two into it, are they still loving it? Quantitatively, you can measure that in engagement and retention. How often are they using it? Are they using it every other day? Two months from now are they still using it just as frequently? By and large, if you can show both of those things, then you probably do have product/market fit. Adam: You started as the growth engineering team, but then built out the org to include dedicated PMs, designers, and all the other functions that we come to see in what is the classic sense of a growth team these days. Were you looking for the best engineers or product managers from other teams, or are there certain soft skills in this cross-functional environment that you tended to look for above that? Our role is to bring a little bit of data to a larger company and add some balance to it. Siqi: The base traits for a growth person are generally a combination of left brain and right brain. You want someone who is highly analytical, and also highly creative. Analytical so that they can prioritize correctly and work on the most effective things, and creative so that they can come up with ideas to prioritize. In a larger company you’re definitely looking for someone who has a little bit more diplomacy, the soft skills to get something done. It’s always cross functional, and you have to work with a ton of teams. It’s very, very easy to be stereotyped as the arrogant data people who always have the answer. We try definitely to not do that. There’s this quote, “if all we have is data, let’s go with data, and if all we have is opinions, we’ll just go with mine.” Inside our growth team we try to flip that. We say, if all we have is data, let’s go with data, but if all we have is opinions, we’ll just go with yours. We don’t want to be taking our opinions, and arguing against everyone else’s opinions. That’s not our role. Our role is to bring a little bit of data to a larger company and add some balance to it. That’s not always going to be the case, but at Postmates it was more of a design and intuition-driven company, so we felt like that was the right fit for us. Adam: What put the most stress on your growth team as you scaled, and how did you respond to that? Siqi: Taking on new components of growth. When we started we were perfectly happy running growth engineering, making sure that our data was instrumented and putting together a growth platform, but the organization needed more help. When I was asked to manage competencies where I didn’t have any experience, that was always a tough situation to be in. I tend to do well when I have some kind of functional expertise in what I’m doing, and I didn’t have any functional expertise in, for example, performance marketing or SEO. So the answer to it was, you try to learn as fast as you can, get up the speed as fast as you can, and use that knowledge to recruit the best people. You make sure they’re working well with other teams and putting into the overall system, culture and processes of the growth team as a whole. Adam: So much of meaningful growth work, whether it’s growth marketing or all the in-product growth changes you can make, comes back to measurement and data. You like to say, “Measure first, measure always.” Is there a point where growth teams can become over reliant on data and end up chasing metrics? Is there a line to be drawn? Siqi: There totally is that line. “Measure first, measure always” was the first of our three values as a growth team at Postmates. That made sense, because we were the data-driven part of Postmates, a larger organization that was more design and intuition driven. There is absolutely a point where you’re completely over reliant on chasing metrics. Zynga certainly is an example of that. At Zynga I observed that being intensely data driven makes you biased in two ways. One, if you’re intensely data driven, you’re biased towards things that are easy to measure. For example, it’s easier to measure revenue than user sentiment. Often those two are exact odds with each other. You’re also getting biased towards things that are quick to measure, versus things that take a while. For example, measuring daily active users, versus retention. If you have bad sentiment, maybe you make a few more bucks today, but you’re going to have angry users go tell their friends and three to six months down the line you’re going to have a smaller business. At Zynga I actually played the opposite role where I tried to advocate for, “Hey, data is great, but we have to design fun games, and we have to measure with the long term in mind.” There needs to be a balance, and at Postmates it worked incredibly well, because for a time I was working on both the consumer product team, and the growth team. Over time we split that out, worked side by side, and it was great. We had a team that was able to completely focus on delighting the user, frameworks and the long term and you have a growth team that’s more focused on just being hard headed about data. Adam: “Measure first, measure always” was one of the three principles of the growth team. What were the other two? Siqi: The second value we had was prioritize ruthlessly. Prioritizing is the most important thing you can get right. We were not simply satisfied shipping something; we’re only satisfied when it’s the most effective thing we know of to ship. The third value is to continuously deliver. We move fast, we try to drive results quickly, and we continuously ship. Adam: Today you’re the CPO for a very different type of product experience, GloStation, an Alibaba-backed VR escape room experience. What are the similarities and differences in terms of how you attack growth for this very different experiential product? Siqi: The biggest difference is there’s not a whole lot we can measure at this size. The product is actually a series of retail locations, where customers actually buy a ticket and experience it. When you’re acquiring users, you’re acquiring dozens a day. Obviously we’re franchising and expanding quickly, but at this point we’re just designing a great experience. So that’s hard to get used to, because even when you’re working on and running tests with a digital product, you can get a couple hundred installs a day. Here we’re selling something retail, so that’s quite different. The other thing is how different physical design is. We have to design the interior, the service, the words that people say with each other, all of the edge cases. You can’t measure everything the way that you can a digital product. You can’t measure everything the way that you can a digital product, so it’s quite different. We try to use as much as we can from what I’ve done with growth marketing and building a growth marketing stack, but what I’ve realized as I’ve been working on this product is most of the experience we just can’t measure. We have to be okay with that. That’s kind of disconcerting, but at the same time, we know that people love the product, so we have that and we can see, and hear them as they’re using the product versus when you’re making an app, they’re just interacting on their phone. That’s also quite different. So I would say we are using the experience in the places where it makes sense, but it’s largely a learning experience for me. Adam: You’ve only been in this gig for I think a couple of months now, but going back to when you originally stepped into the door, what did you bring with you from Postmates into how you’re approaching this new position? Siqi: Going back, the reason why I wanted to join Postmates is my entire career I’ve only worked on digital products. From NASA to Zynga, to games, to my last community, it’s just been apps, and Postmates was really interesting to me because they interact with the actual real world and they work on logistics. I wanted to understand how to do that and what that’s like. I was blown away by the culture when I joined Postmates. It was incredibly aggressive, awkward environment, it’s very difficult and oftentimes slow to get things done in real life, and it was a culture that wouldn’t take no for an answer. If we could do it today, we would. That’s probably the biggest thing I took away from Postmates that I’m bringing to GloStation. A very similar environment where our product itself is digital, and it’s delivered in a physical environment. So everything from getting a license from the government, to getting construction done, to hiring is very slow and difficult, but you have to execute very quickly given that it’s a venture-backed company.I’m very thankful those learnings that I got from Postmates and how powerful their culture was. Adam: Is this the year that VR finally begins creeping into our everyday lives, or are we still too early in the hype cycle? Siqi: I hope so. I think it’s early, I think we’re going to start seeing it this year, but it’s going to really go mainstream next year. Everything that’s possible to experience the physical world is theoretically possible to experience in VR. It’s a question of technology. Similarly, many things that are impossible to experience in real life, you could experience in VR, so the power of that medium is absolutely inevitable and it’s getting better very quickly. My thesis around how it goes mainstream – and it’s not mainstream today, it’s in the trough of sorrow – is that it will go mainstream outside of the home first. This is after having experienced the product of GloStation, which is why I joined. There’s a gap between the experience you can deliver to somebody with custom hardware outside of the home, that’s at room scale with enough free space to walk around freely without wires, and what you can get at home, which is mostly a seated experience where you’re a disembodied head between two controllers. It’s a difference between well VR today, and the holodeck kind of experiences. The constraint is cost and hardware, but the biggest constraint is literally real estate. That is not going to get cheaper anytime soon. Adam: To close out, I’ve got a few rapid fire questions growth questions for you. Quick answers, but feel free to expand on any of them that you like. So, favorite or most underused growth tactic? Siqi: This one nobody uses, but I love it: There is a Twitter poll ad unit that I can’t believe people don’t use. It’s basically the most viral ad you’ve never seen. It lets you choose between two options and the minute somebody votes, it prompts them to tweet out their vote. Everyone who sees their tweet, gets prompted to vote again. For the Mayweather vs McGregor fight we did a team Mayweather and Team McGregor ad unit. Pretty much we took over an entire hashtag for a cost of about a thousand bucks. Adam: One book that has influenced your thinking and why? Siqi: This is a book I reread once a month, but I really enjoy “The book” by Alan Watts. It’s relaxing when you’re stressed, and because I’m a pretty left-brain person, it helps open up the right brain a bit when I need it. Adam: Someone in the growth community that either you look up to and/or you think our audience could learn a lot from? Siqi: It’s cliché, but I got to give a shout out to my cousin, Andrew Chen. I learn everything I know from him, and I think they’re doing amazing work at Uber. Adam: Your favorite onboarding experience, because I know you have to be evaluating these things in your personal life? Siqi: Sweatcoin. It pays you in cryptocurrency for walking, but they have a fantastic onboarding experience. It’s almost chat based, and extraordinarily well designed. Anchor is also great. It’s a short form audio podcasting app, which micro-sizes the creation of audio content. It’s an almost purely audio-based onboarding. When I tried it recently, it blew me away. It was very well done. Adam: You mentioned chat there. Messengers, are they a game-changing new channel for growth, hype, or is it too early to say? Siqi: I think it’s extremely underrated for growth. I am aware of multiple products that have really quickly reached tens of millions of players through messenger. Some of the things that you can do reminds me of the early days of the Facebook platform, and people aren’t really talking about it much. I think it’s extremely underrated. Adam: One app or tool you cannot live without. Siqi: The Fabulous has been a daily habit for mine. It’s an app that through cognitive psychology tries to create habit change with you through very, very small steps, and it’s extremely well designed and effective. Adam: Lastly, what’s a common mistake that you see growth teams make when it comes to running experiments? Siqi: When you have a great win with an experiment, the result is very obvious, and you’re going to go and communicate it out. When you have a big loss as experiments, and things don’t go your way, it’s also very clear what to do. You stop running it and you look to see what you got wrong. The most interesting things are the neutral results, when things don’t do anything. Usually when you do an experiment you expect something to happen. When it doesn’t, I feel like that’s the most interesting thing, which means that either something is wrong about your intuition or your mental model for a user, or you missed something. I find that a lot of growth teams make experiments run too long and they ignore or don’t spend enough time looking at those neutral results.